Remember the old Twilight Zone where the creepy kid runs the household and reads the minds of everyone in town? The only way the community can survive is by mumbling, ‘It’s a good day’ so the little monster can’t get hold of their thoughts. Back in a different lifetime when I worked in the Operating Room, life was pretty simple to sum up. It was a lot like the Operating Room itself. Things were either sterile or unsterile, asleep or awake, dead or alive. A good day was easy to recognize; you got to work without forgetting to give your kids lunch money, you didn’t get a flat, you got there on time, your patients made it through surgery, and you didn’t have to work with the podiatrists. When you are living the charmed life, as I feel I am now, it is harder to determine whether or not you are having a ‘good day’. Wouldn’t everyday be good if you didn’t have to get up at five to go to work? Not necessarily. The truth is that you expect more out of life, and probably yourself, when you don’t have to work as hard at getting it. It is easy to allow small annoyances a place in the scheme of things. The little foxes spoil the vines, to quote the wisdom of King Solomon. I am back to critiquing myself. I better accomplish something everyday. And it better be good. Remember those early days here in the new land? I took my time, gave myself a break. That was short-lived. Now its work! Get up and do something! Accomplish! Create! This past week I had some time off. I went to Lansing and saw, finally, The Phantom of the Opera as a guest of my sister Liz and her daughter. It was so wonderful! I sobbed through the whole thing, not so much at the play itself, but at the effort it took to make the beautiful costumes, and the fabulous sets. As a theater goer of many years; we were season ticket holders at Walnut Street Theater in Philadelphia for fifteen years, had a daughter who went to theater school off-Broadway, and have always been a supporter of regional theater, I was really impressed. The familiar music was breathtaking live. I will see it again if it comes around here. I was starting to get a little nervous from having to sit so long, but made myself relax. I had given myself permission to go home, but decided I was being silly. Relax, enjoy the company. We had lunch, went shopping, visited, it was great. I got to spend time with my sis Sarah, and my mom. The next day when I left for home, I took a detour through Eaton Rapids to visit a yarn shop I frequented when I just learned to weave in 1975. It was still there! Old Mill Yarn it is now, was Davidson’s Old Mill Yarn a million years ago. I bought some undyed, textured raw silk. When I left there, I decided to have an adventure. Knowing I would just go home and work, I wanted to drive the back roads, maybe follow some of the same paths my parents used to take when they would go on antiquing jaunts on the way to Saugatuck. I did feel closer to my dad while I was on the roads. I imagine he and my mother saw some of the things I saw; Gilbert’s Car Museum, Hickory Corners Antique Emporium, some little hole in the wall coffee shops. What is normally a two hour ‘death run’, as my father used to call it, turned into a four plus hour leisurely cruise through hilly, forested countryside. Of course, by the time I got home, I was cross eyed. Not enough sleep the night before. The following day, which was Monday, was a total bust, except! First of all, I got to spend time with my neighbor, Terry. He and I went to my friend Betty’s to pick up some glass for stained glass. While they were sorting through the colorful treasure, I got to spend some time with her husband Jim, who is a remarkable story teller. He doesn’t get a chance to get a word in edgewise when Betty and I are together, so it was really nice to get to ask him some questions about this area we live in. He has been here all of his life, and remembers all the places I remember from my childhood summers. 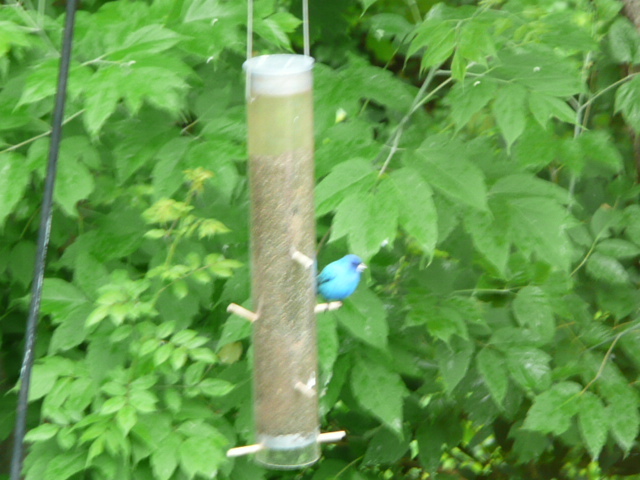 When I got home, I saw, for the first time, an Indigo Bunting. The little guy really was a breath-taker! I also saw a bright orange Oriole, but didn’t have the camera ready and have not seen him since. This little blue guy is around all the time now. 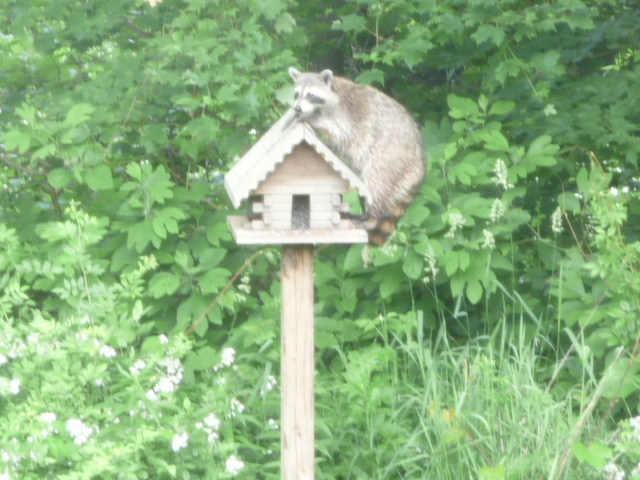 Our finch feeder was stolen by the raccoon last night, but Jim rushed out early this morning, making a run to Holland, to get another. There are priorities. Here’s a pic of the raccoon. I’m ready to let Jim and Betty have a go at him. Yesterday, I was back to my usual crazy self, running hither and yon all day. And then I had today. I told Jim, it is becoming one of those days that I will mark as being what life is all about here in our new home. Early, as I was walking to put my signs out at the road, I saw our neighbor, Terry. What can I say about our neighbors except we are the luckiest people to have them. Terry is a gardener at heart, and an artist, too. He and Kirk make everything about living here fun. I am so grateful for them. Kirk came over to the studio later to see my new toy. (really, old toy, my friend Yoko gave it to me about three years ago.) 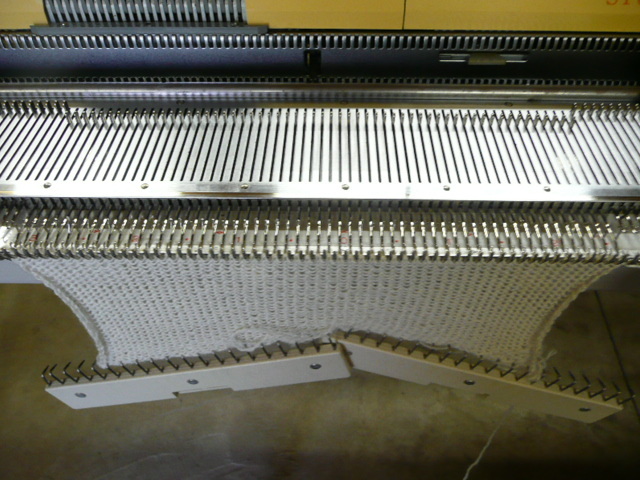 Yes, you are seeing correctly; I am using a knitting machine! My friend Trish, in all her generosity, offered to come here and help me set it up. She drove from Holland early in the morning, going out of her way, getting lost, thanks to gps. She was a great teacher, and had me knitting in no time. I am in love with this. While I was playing around with it, I dyed all of this. Kirk gave me creative support. How lucky am I to have a designer live next door?! 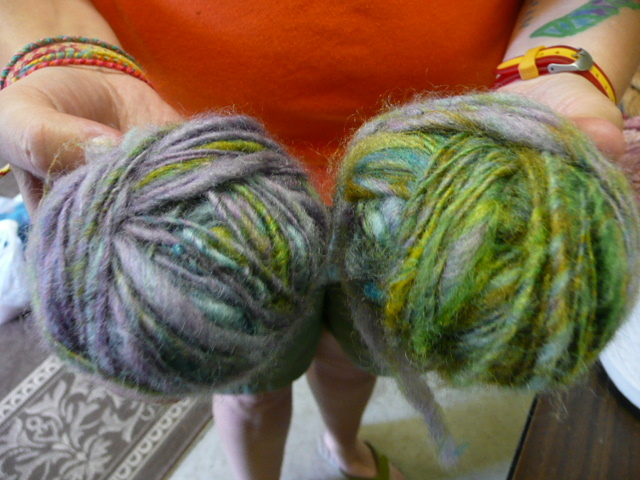 Then, my new friend Cat, also Trish’s friend came over to show me the yarn she spun out of the fiber I clean off the carding machine between colors. She brought her two boys with her, who loved the sheep. Now anyone who knows the two prim ladies, knows they haven’t spent much time with little boys. They weren’t too sure what to think. But later today, they were bellowing, looking around for them. I think they liked them alright. Fantastic thoughts for pondering on… I will have to reread this one. 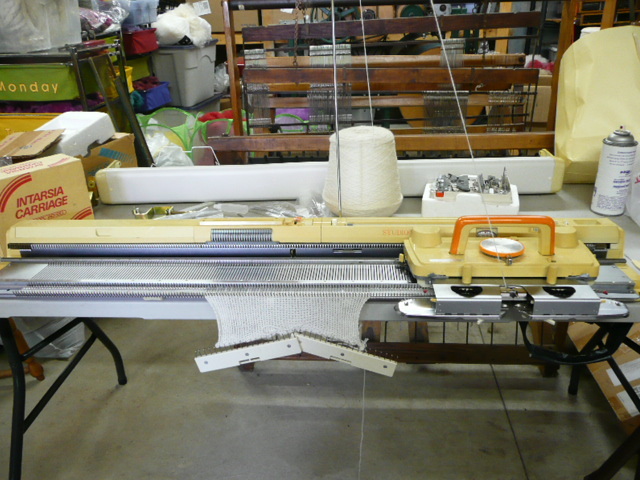 But in the meantime I must comment on your gorgeous dyed yarn and your extremely creative use of sydell panels. 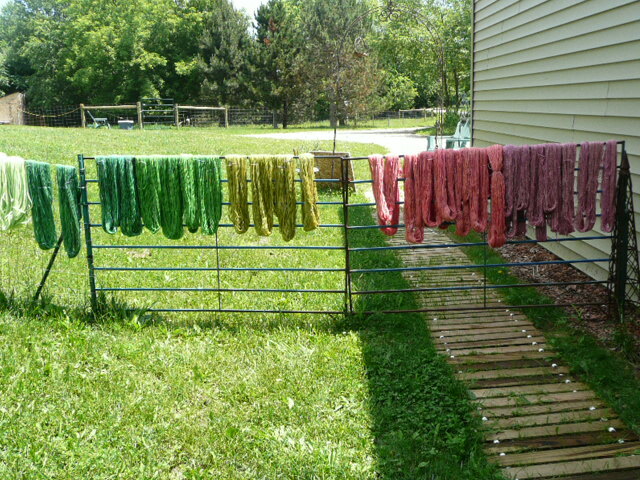 We have used them for many things around here but never drying yarn… yet! I sounds like it was a FAB U LOUS day!!! I love the pictures. I love the colors! !